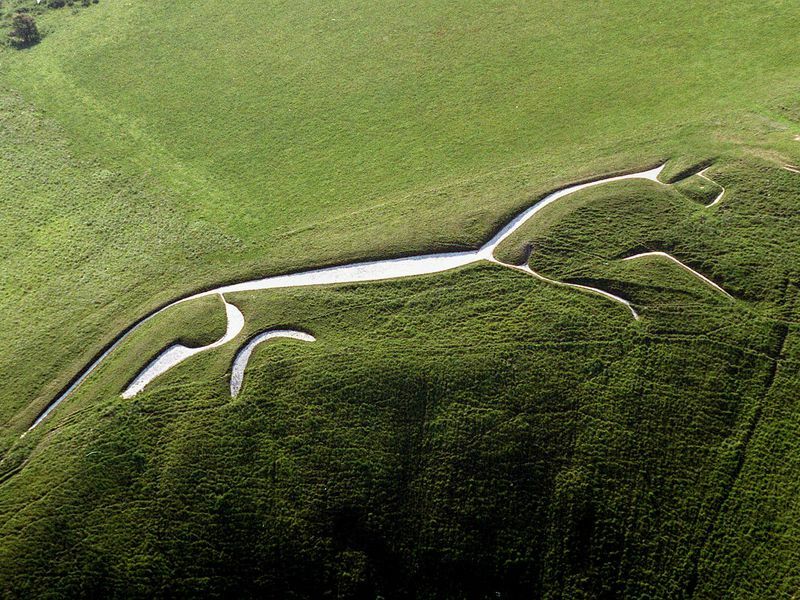 For more than 3,000 the Uffington horse has glowed white. Without constant maintenance, the horse would have vanished into the foliage in 20 years. The Uffington White Horse is the oldest of the English hill figures. For more than 3,000 years, it has run across the flank of a hill — a enormous pictogram the size of a football field and visible from 20 miles away. Of course, when this primitive drawing was first cut into the hill, the only way to see it in its entirety was from the valley below. The complexity of creating a figure of this size and shape from the ground is mind boggling. 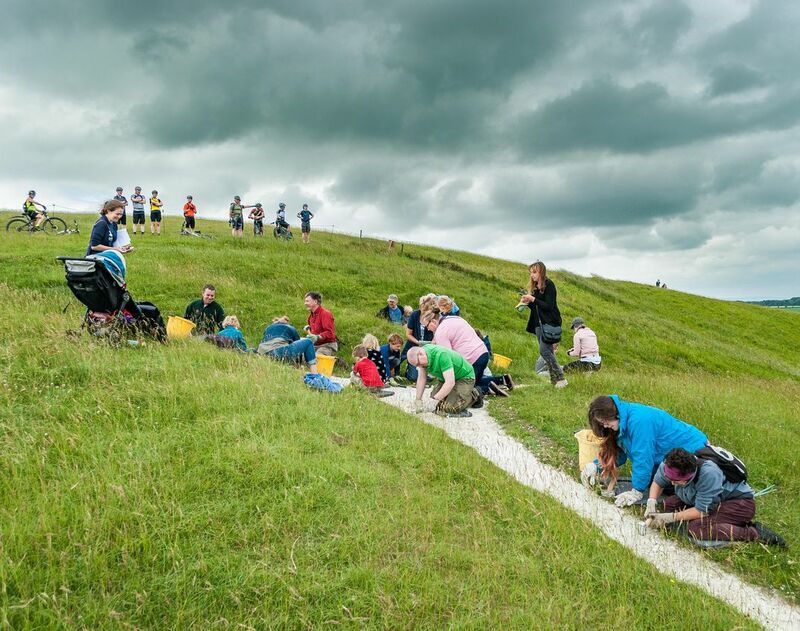 The White Horse is maintained on Chalking Day, a ritual where volunteers are given hammers, buckets of chalk and kneepads. The chalkers kneel and smash the chalk to a paste, whitening the stony pathways in the grass inch by inch. It’s technique as ancient as the horse itself. If the horse wasn’t maintained, it would be gone in just a few decades, reclaimed by the hillside grass or erased by erosion. Archeologists believe that chalk figures were integral to the social groups of the time; that part of the benefit of the horse was the ritual gathering to maintain it and create a societal bond. Excavation of the site in the 1990s confirmed its prehistoric beginnings. It also showed that the design for the figure was cut into the hill at a depth of up to a meter — not just scratched into the chalk surface. This made it possible to date the layers of quartz in the trench. The results of the testing showed that the horse was created at the beginning of the Iron Age, perhaps even the end of the Bronze Age, nearly 3,000 years ago. Chalking or scouring the horse. This photo gives you a sense of the massive scale — and the amount of planning and coordination required to “draw” a picture of this size without the benefit of an aerial view. The original lines were created using antler picks and spades — to dig through the earth and expose the chalk layer. Mystery surrounds the horse. No one knows why the horse was made. One theory is that since in Celtic art, horses were shown pulling the chariot of the sun, this horse was placed so that the sun crosses over it. The shape of the horse has changed over the centuries, modified by erosion and repeated recutting. The present outline may be only a part of the original: aerial photography shows that a larger, more conventional shape of a horse lies beneath. Some believe that it wasn’t a horse at all — put could have been a dragon or a mythical creature. But it’s certainly been called a horse since the 11th century. That is super cool and something I knew nothing about…Thank you! Visiting the White Horses is very high on my bucket list of things to do. It’s fascinated me for years.